A few years ago I published a neat little paper with Don Henderson on the possible posture pterosaur might adopt in water. This was done to try and see if they might have issues if they became stranded on the surface and especially if the head was left at or even under the surface (you can read about this in some more detail here). However, what I want to talk about in this post is how badly and how often this simple paper seems to have been misinterpreted. I’ve been thinking about this for a while but Heinrich Mallison has just linked to an old post on his blog making the same general point about accuracy of citations. Like him, I’m sure I’m not blameless and we all make mistakes occasionally and cite the wrong paper or misattribute a source or get some details wrong. It happens and while obviously not ideal, such is life. However, some papers more than others seem to suffer from this and the floating pterosaur paper is one of them. It is only a short paper, under 10 pages long and there’s lots of figures and references in that too and the subject itself is fairly simple so one would hope to minimise confusion. Unfortunately, this seems not to be the case and it’s already acquired a number of citations and comments that at best miss the point and at worst say the direct opposite of a point we made. Below are some direct quotes from papers and then points or quotes from the original paper to show how these are quite incorrect. I won’t directly name and shame the perpetrators as the point here is intended to be illustrative of the problem rather than go after colleagues when I can’t rule out having made the same mistake myself somewhere. First off our study was apparently carried out in order to ‘imitate the swimming strokes of pterosaurs’. In the title and throughout the paper we refer to the floating posture and talk about static posture in water, not swimming per se. While in the discussion we did refer to the posture some pterosaurs took in water and pointed to how it matches putative swimming tracks, this was clearly not the aim of the paper. That makes this point a bit wide of the mark, but not bad and a rejig of the phrasing would clear this up. Next up, we apparently show that ‘pterosaurs would not have been able to float without tipping over’. That’s clearly not correct as can be seen from the figures (see below). We do discuss the issue of tipping forwards in pterodactyloids in some postures, and the heads are indeed low, but that’s not the same as saying that all pterosaurs did this all the time and indeed the pterosaurs were generally stable. Moving onto some greater issues, we apparently state that the ‘hairlike pycno-fibers covering their body would likely not trap a layer of air, as feathers of birds, and could become water-logged’. That’s very clearly not what we say at all as we make the very clear statement that ‘the effect of such a coat may have been positive (trapped air increasing buoyancy) or negative (waterlogged).’. Yes it may have been an issue, but we don’t know and are equally open to the possibility it could assist buoyancy and we point to the fur on aquatic mammals as a possible analogy, so this quote clearly is not in line with our position on what effect pycnofibers might have had. We also are cited for the point that pterosaurs were ‘unable to take off from the surface’. This is not a point we really address (since it’s not directly related to floating posture’ but even in the abstract we say that pterosaurs ‘if immersed would need to take off again rapidly’ which clearly implies we are happy with the idea of water launched and later on we cite Habib and Cunningham and saying ‘A recent study suggests that even the biggest pterosaurs might be capable of taking off from the surface of the water’. In short we’re clearly happy with the idea they could take off from water and while we discuss the possibility that some pterosaurs might not have been able to, at no point do we say that they could not. Then we have this very problematic statement that ‘simulations of the buoyancy of pterosaurs made using computers indicate that these reptiles had no ability to float well in water’. We clearly do not say this and point multiple times to the high pneumaticity of ptersoaurs any say things including ‘it is not surprising that the pterosaur model floats on water’ and ‘We show that in general pterosaurs adopted a position that was high on the waterline’ which make it very clear they floated and floated well. These five statements are varying degrees of problematic, but given that this paper has only less than 20 citations from peer-reviewed papers (and several of them are by me which I don’t think I’ve miss-cited) that points to a pretty high percentage of erroneous citations on this one piece of work. When several of them are clearly flat wrong, and even information in the abstract points to them being in error it suggests that it’s really not been taken on board. Hopefully this paper is simply unlucky in keeping getting such erroneous takes but it’s a shame that a paper that I’m really quite proud of seems to be repeatedly cited for things it doesn’t say or imply. It’s probably only a matter of time before it is used to contend that pterosaurs could not swim (something the paper also clearly does not say) and I’ve seen our paper referenced in this context in popular writing so it may yet go that way in the literature. In short, read papers properly and check what you are saying. It’s important. If you have read this far, I’ll trouble you for a few more words. You have read this blog post and may well have read many others of mine or enjoyed my book, seen TV shows I’ve consulted on or heard a podcast I did. If so, please take less than one minute to fill out this survey for me. Shark vs Pterosaur. By Mark Witton. 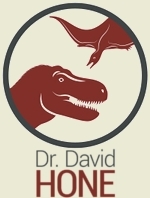 Over the last 10 years I have published quite a few papers on various feeding traces, shed teeth and stomach contents that help demonstrate and refine some understandings about who ate who in the Mesozoic. These are often very interesting but also frustratingly incomplete and it can be hard to identify one, let alone both, of the protagonists and in any case these are often isolated examples that may or may not represent wider trends. Still, at least sometimes there can be a good set of marks with repeated patterns and enough data to be quite confident about a relationship. One such is that between the classic giant pelagic pterosaur Pteranodon and various sharks from the Cretaceous, most notably Squalicorax. This is no big surprise, these pterosaurs were spending a large amount of time out over the water and could probably dive and swim after prey, even if they didn’t likely sit for long on the surface when they did so. Even aside from the possibility of being caught, at least some pterosaurs must have died while out over the water or been stranded and ill or injured on the surface and that would inevitably attract large predators to come for a meal. Given the huge numbers of Pteranodon bones we have, it should not then be a surprise that there are a good number of them described with various bite marks that can be confidently attributed to large sharks. Pterosaurs were generally lightweight for their size but that doesn’t mean there was not some decent muscle on them and modern seabirds are not infrequently eaten by sharks providing a nice analogy too. ‘Complete’ Pteranodon at the LACM. Such data though is limited to marks on bones and it’s always nice to have something more detailed than this. 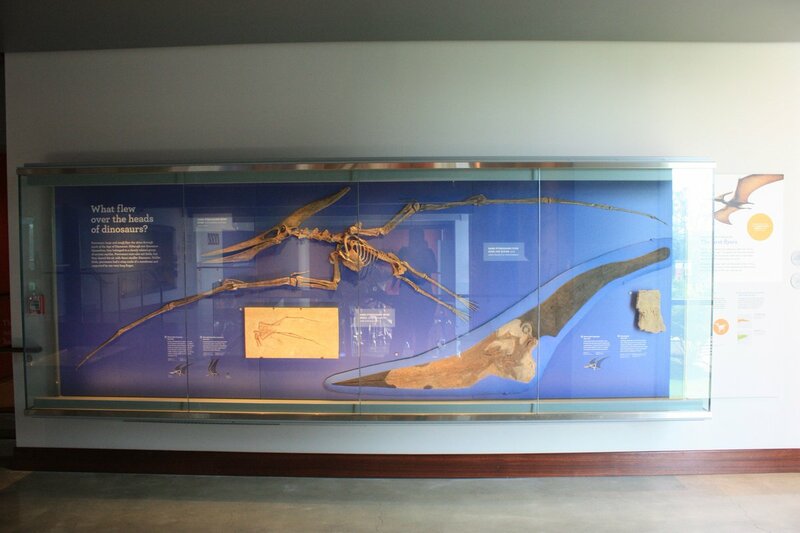 Although mentioned before in several previous papers, one outstanding Pteranodon specimen in LA has never been described or illustrated properly and so when I got my hands on it while visiting Mike Habib a few years ago, it was rather inevitable that something would happen, and the paper on that, with the healthy addition of Mark Witton as a collaborator, is now out. The indivdual in question is mounted as a lovely complete (and sort of 3-D) pterosaur on display in the Los Angeles County Museum but it is a composite of somewhat indeterminate origin and it’s not entirely clear how many individuals were used to make it or how complete any of them were. What is clear though is that there is a short series of articulated cervical vertebrae and that these have the tooth of a decently sized shark with them. It’s trapped under a prezygopophysis so it’s hard to think it just drifted in there by chance onto a skeleton at the very bottom of the sea, and while the tooth doesn’t look like it penetrates the bone it is a reasonable interpretation that this is a shed tooth from a bite. The tooth is diagnostic of the large pelagic shark Cretoxyrhina and we have a good enough idea of where in the mouth it sat which means we can get decent estimates of the sizes of each of the two animals here. The Pteranodon clocks in at around 5 m in wingspan with the shark being 2.5 m in length, but despite this apparent discrepancy, the shark would have been by far the heavier animal and in the water it would swim rings round the pterosaur. In short, while we don’t know quite what happened here (was it predation or scavenging) it looks like a decent sized shark took a chunk out of a pterosaur and lost a tooth in the process. This is the first record of sucha trophic relationship between these two genera, though of course various unattributed bites that are already known might also have been made by Cretoxyrhina. However, despite the large numbers of Pteranodon specimens known, apparent bites on them turn up in only about 1% of cases. In some ways this may sound like a lot but there’s perhaps a 6% rate of carnivore-consumed interactions known for Rhamphorhynchus, so the open ocean (perhaps unsurprisingly) might have had fewer incidences of large predators getting to grips with large pterosaurs than near shore ones with much smaller animals. All in all though, this adds a nice new point to the dataset on pterosaurs and their position in various food chains. 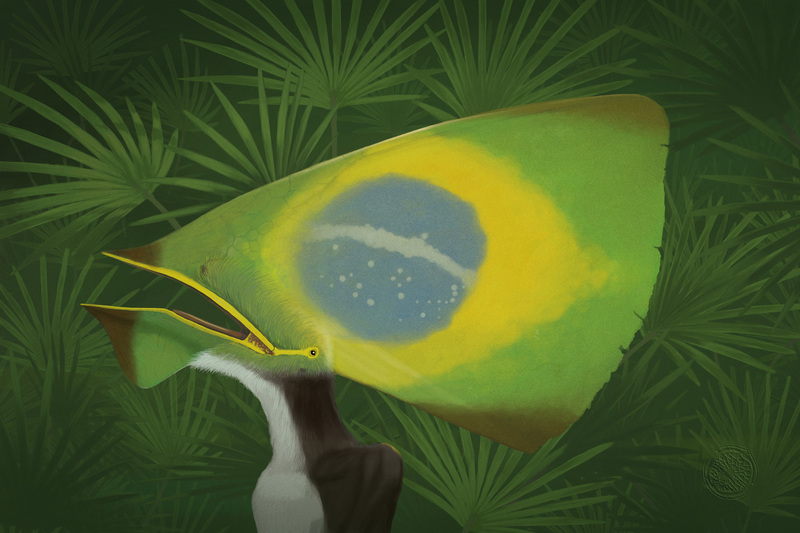 We have a healthy record of them eating things, and being eaten, and each new bit of data like this helps us get a better and better handle on how pterosaurs fitted into ecosystems and how they might have lived, and died, in the Mesozoic. The paper is fully OA and available here. New reconstruction of Noripterus by Rebecca Gelerenter. This is a composite based on all the material we have from various specimens (known material is in white). Immediately after the Munich pterosaur meeting ended in 2007, I moved to Beijing to take up a postdoctoral position at the IVPP. Perhaps the first bit of mail I has there was from the now late Wann Langston thanking me for setting up the Munich Flugsaurier (which he had attended) and sending me a photocopy of his notes and some old photographs he’d taken on a trip to China back in the 80s. This was of a superbly preserved pterosaur hindlimb, and one he wanted to know more about but which had since not been seen by any researcher he knew, or been in the literature. This was a specimen of Noripterus, a small dsungaripterid from China found by, and then named by, C.C. Young back in 1973. The original description of this was both a bit sparsely described, and in Chinese which is a shame as Young mentions a number of specimens, and illustrates or measures only part of some of them. I asked around the curators at the IVPP but no one knew the location of the material and it was suggested to have been borrowed and not returned. Fast forward a couple of years and while Paul Barrett was visiting the IVPP he had been directed by a colleague to a little used set of cabinets in the collection, where apparently some mislaid dinosaur material was residing. I happened to be looking over a specimen in the collections at the time so inevitably was keen to see what might turn up. On opening the case, Paul found his specimens, but one thing I spotted was immediately recognisable from Wann’s photos – the lost Noripterus foot. Accompanying it was quite a lot of other pterosaur specimens with similar specimen numbers – Noripterus was back. Since then I’ve been working on and off on a number of projects on these specimens (hampered by my no longer being in China) and the first is finally out as part of the volume from the back of the 2015 Flugsaurier meeting in Portsmouth. A more full description is in the work but this is the first and important step because the taxonomy of the Asian dsungaripterids has been an issue that’s been problematic for quite a while, and much of it hinges on Noripterus. Things have been difficult to resolve because as noted, the original description doesn’t give that much information on the material (and less if you don’t speak Chinese – I am indebted to my collaborators here as you may imagine). If you want to sort out how various other species and genera relate to it (or not) you really need to know what it actually is anatomically and taxonomically, and so having the specimens available means we can make some significant updates to Young’s identification and how other more recent discoveries might relate to it. First off the bad news – what was originally designated as the holotype is mostly still missing. Only a fragment of the jaws remain and they are not in great condition. Still, they are diagnostic which helps us to define Noripterus better. On the good news side of things, there is a lot of nice associated material as Young collected multiple specimens from just a few sites and despite the lack of overlap in some areas, there’s some good reasons to think they are all the same thing. Noripterus is known from several superbly preserved specimens including a near complete set of limbs and girdles preserved in 3D. There will be more on this in the future, but obviously it’s very useful material to have. Working out quite which specimen was which however actually took quite some time and detective work. The field numbers on the bones and the specimen numbers on the boxes they were in, did not always line up with the identities given in Young’s paper (either illustrations or the few measurements). Eventually though we got this sorted out and so one part of the paper gives some new specimen numbers and sorts out the various specimens into their (hopefully) correct sets. The main issue though is the taxonomy itself of these animals. Noripterus was only the second dsungaripterid identified (you may not be shocked to learn Dsungaripterus was the first) and so it might not be a surprise that it’s considered a valid taxon. It is rather smaller than it’s more famous relative, and has straight rather than curved jaws, as well as rather more narrow teeth. That’s the easy bit. Then we have ‘Phobetor’ from Mongolia, named from some very fragmentary material that has never been described in detail. 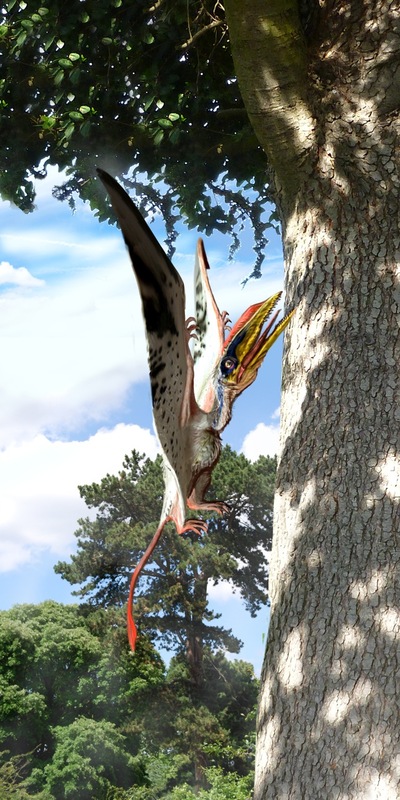 More recently there’s more Mongolian stuff from 2009 called the ‘Tatal pterosaur’ that was used to link together that material, ‘Phobetor’ and Noripterus all under the latter name. On top of that we have the Chinese genus Longchognathosaurus known from little more than a few bits. Clearly lining these up and working out if there were one, two or three genera was going to prove difficult while 2 of these 4 sets of specimens were fragmentary and most had never been described or illustrated properly. In this context, getting to see Noripterus was clearly very useful in terms of making some meaningful comparisons of key characters. So, what did we find? Well, actually the Tatal material and the original ‘Phobetor’ are very similar based on the limited descriptions of each suggesting they are the same taxon. However, they have some consistent differences with the Noripterus material which suggests they represent a valid and separate genus and should not be synonymised with it. That also means that ‘Phobetor’ is still lacking a name (it’s preoccupied by a fish). Finally, Longchognathosaurus has at least a couple of the supposedly diagnostic characters present in the holotype of Noripterus and while it’s not necessarily the same thing, it is hard to justify it being unique at this point. Clearly all of this is provisional, and lacking a good skull for Noripterus (or at least the rest of the holotype) would really help firm all of this up, not least when the Tatal specimens include a good skull and Longchognathosaurus is based mostly from cranial material. In fact given how much good Noripterus material there is, it is an oddity that there’s so little of the head, but hopefully more will turn up. In the meantime, this should help move things forwards and provide a better basis for sorting out these taxa and some curiosities about their relationships to other pterosaurs (in particular Germanodactylus which may or may not be an early dsungaripterid). Now we just need some more detailed descriptions of all the other Asian dsungaripterids (and yes, more on Noripterus too) but this is a start. TLDR: We have a good amount of Noripterus back. ‘Phobetor’ is probably separate and valid and the same thing as the ‘Tatal pterosaur’ material. Longchognathosaurus is probably not valid.